This week saw the launch of two admirable projects that stand to make a significant contribution to global access to open educational resources. 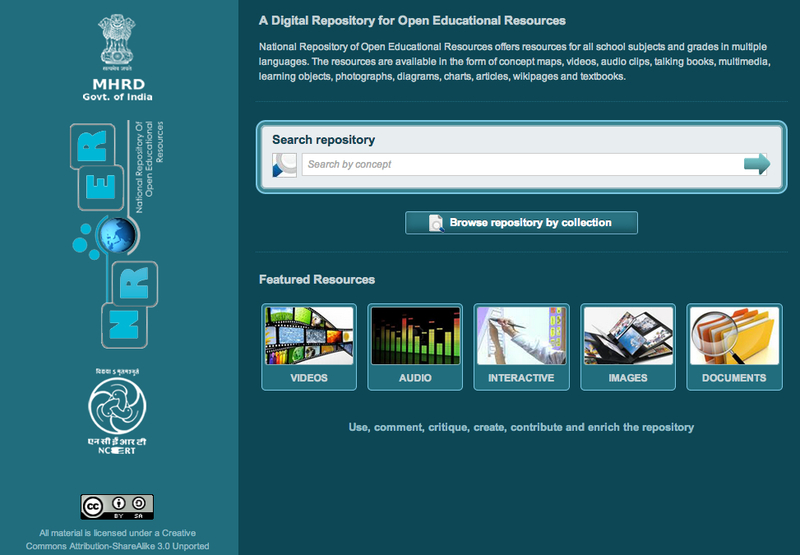 In the USA the Getty Trust announced their Open Content Programme, and in India, the Ministry of Human Resource Development launched their National Repository of Open Educational Resources. 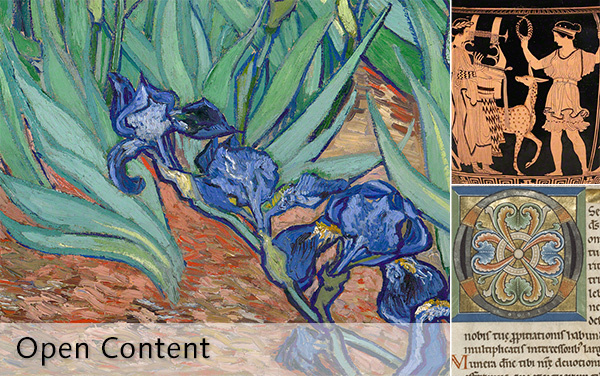 all digital images to which the Getty holds the rights or that are in the public domain to be used for any purpose. No permission is required. In the first instance almost five thousand images from the J. Paul Getty Museum have been made available, with plans to add images from the Getty Research Institute and the Getty Conservation Institute in the future. There are also plans to open access to the Getty Vocabularies and outputs of the Conservation Institute’s field projects. The Getty was founded on the conviction that understanding art makes the world a better place, and sharing our digital resources is the natural extension of that belief. This move is also an educational imperative. Artists, students, teachers, writers, and countless others rely on artwork images to learn, tell stories, exchange ideas, and feed their own creativity. it is now the mark—and social responsibility—of world-class institutions to develop and share free cultural and educational resources. Adding “I agree wholeheartedly.” And so do I! The approach adopted by the Getty Open Content Programme is interesting as they make no attempt to restrict access to their resources on the basis of how they will be used. Unlike the National Portrait Gallery and the British Museum in the UK, who will only allow their images to be used free of charge for non-commercial purposes, there are no restrictions on using Getty images commercially. Users are requested to use the following source credit when reproducing an image, Digital image courtesy of the Getty’s Open Content Program. Some images may include people or objects for which a third party may claim rights such as trademark, copyright, privacy, or publicity rights. 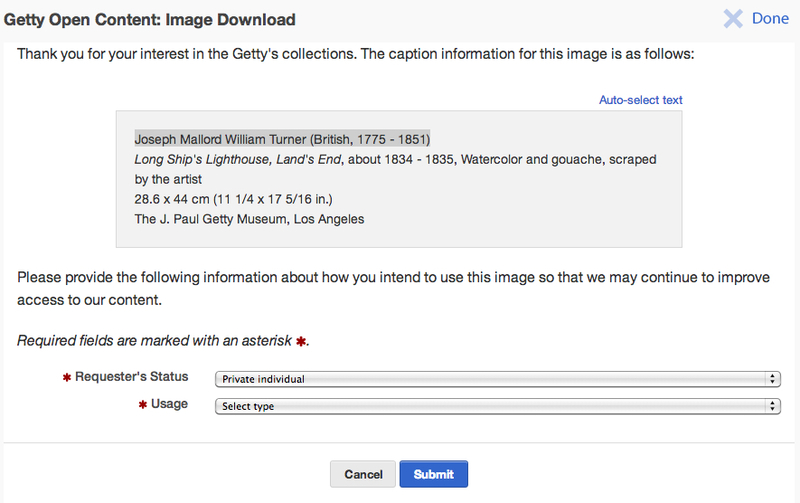 The Getty does not warrant that all of the images designated for downloading are free from rights claimed by third parties. As the user, it is your responsibility to ensure that there are no restrictions based on third party rights. 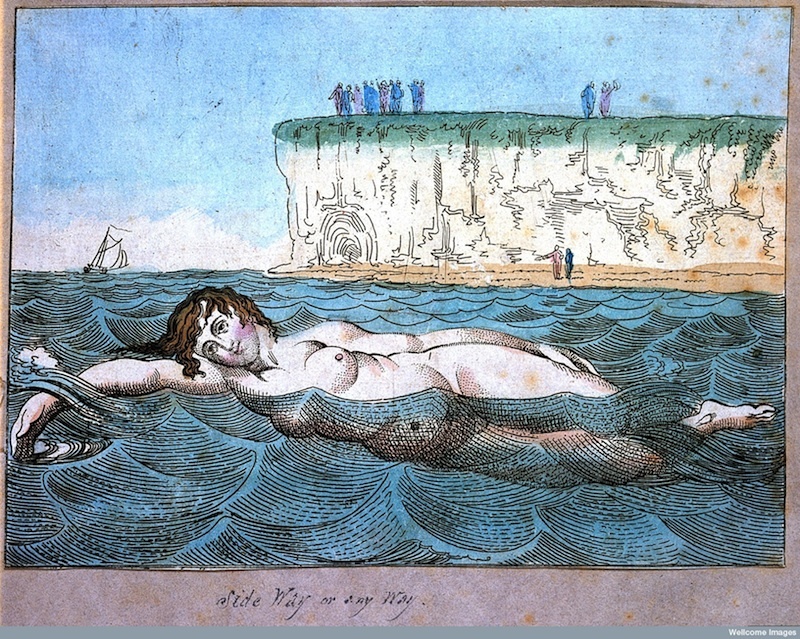 The Getty assumes no liability for your use of these images if a third party makes an infringement claim. Getty would appreciate a gratis copy of any scholarly publications in which the images are reproduced in order to maintain the collection bibliography. It’s also interesting to note that Getty have completely bypassed Creative Commons, and in fact their OCP images don’t appear to carry any licence at all! I’m very curious as to why this particular approach was taken and what the potential pros can cons are of releasing images without any obvious licence. That coda aside, I think this is a hugely admirable project and I hope other heritage institutions around the world are encouraged to consider opening access to the wealth of resources they hold. bring together all digital and digitisable resources for the school system – for all classes, for all subjects and in all languages. The concept map itself is a learning resource for teachers, providing an opportunity for critically assessing the curriculum and aiding the construction of their own unique learning themes for their classrooms. 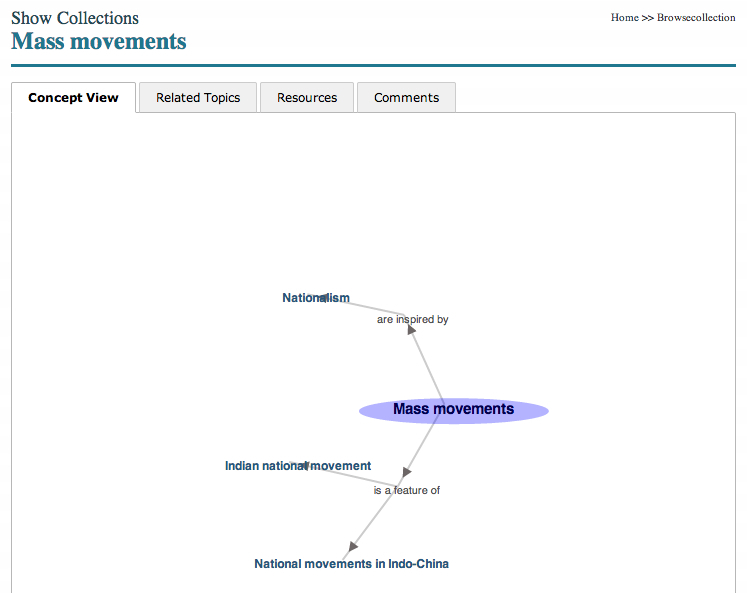 The digital resources – documents, audio-visuals, interactive objects, images are mapped to the concepts. This enables access to a library from which teachers can choose appropriate resources. It’s an interesting approach and, if the repository really takes off, it will be fascinating to see how this works at scale. The repository and all its materials carry a CC BY SA licence and while there are no conditions or restrictions placed on downloading resources, users must complete a captcha before adding comments to resources held in the repository. Although the repository already contains an impressive collection of content, the metadata is, dare I say it, a little thin at present. For example, images are accompanied by topic tags and the date and the name of the person who contributed them, however very little information is provided about the provenance of the image, where or when it was taken, and who the creator was. Hopefully this is information that will be added as the repository develops. It’s great to see two high profile open content initiatives being launched within the same week and I very much hope they will encourage others to follow suit.